Situated between the Black Sea and the Aegean Sea, the Sea of Marmara is a rich soup of nutrients and life and surrounded by a rich history of civilization. Like the Black Sea to its northeast, the Marmara has an unusual layered structure with fresher water near the surface and much saltier water near the bottom. 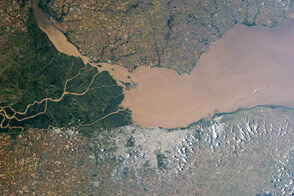 That fresh surface is fed by exchanges with the Black Sea and by flows from the Susurluk, Biga, and Gonen Rivers. 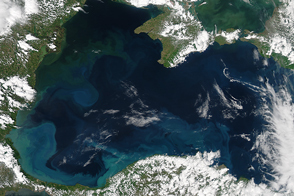 The fresh water (just two thirds the salinity of the ocean) makes it easier for floating, plant-like organisms—phytoplankton—to grow, as does the abundance of nutrients pouring into the seas from European and Turkish rivers. 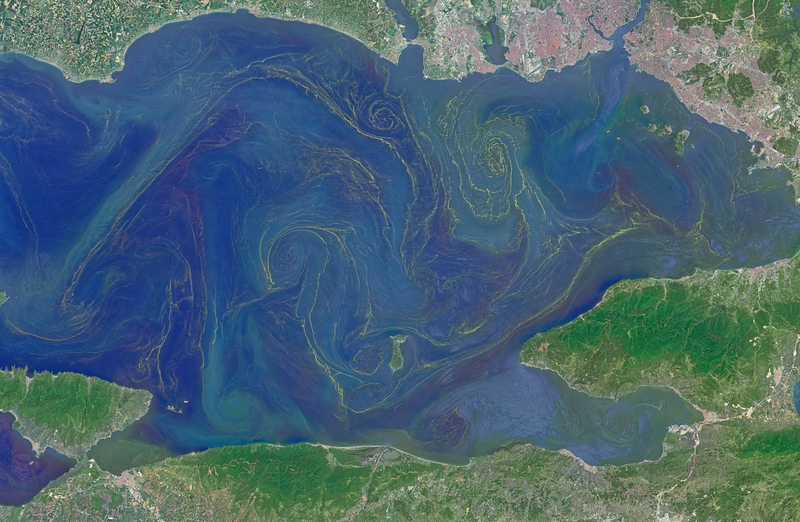 The Operational Land Imager on the Landsat 8 satellite captured this image of a phytoplankton bloom in the Sea of Marmara on May 17, 2015. The sea is surrounded on all sides by the nation of Turkey. The swirling shapes on the water are phytoplankton, with the yellow-green and red-purple filaments likely (but not necessarily) representing different species. Those wavy colored lines not only show where the densest concentrations of plankton are floating, but also reveal the eddies and currents within the small sea. Waters rushing in through the narrow Bosphorous Strait (at Istanbul) and Dardanelles Strait (off the left side of the image), as well as a jagged coastline and tectonically fractured seafloor on this edge of the Asian and European continents, all conspire to create intricate mixing patterns. If you download the large image and open it in full resolution, you also can see ship tracks crossing the bloom lines. 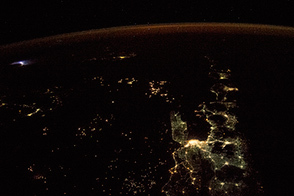 According to scientists Baris Salihoglu of Turkey’s Institute of Marine Sciences and Ahsen Yuksek of Istanbul University, the blooms in the satellite image are mostly Prorocentrum micans and Noctiluca scintillans. They recently sampled the waters of the Marmara and found that Prorocentrum bloomed first, though Noctiluca eventually dominated. 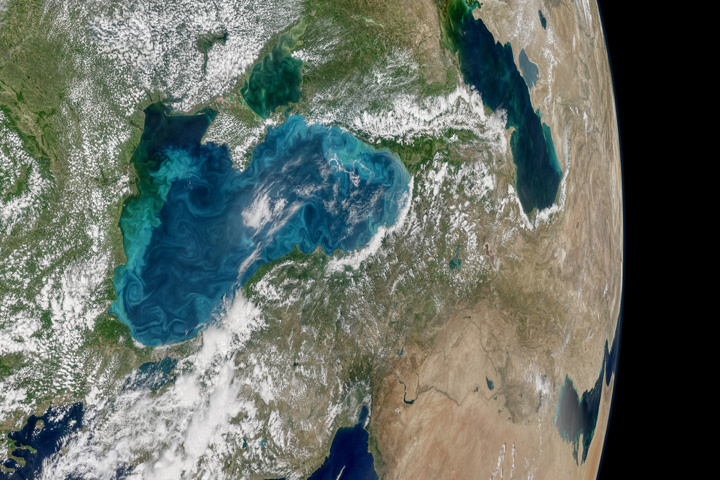 The Moderate Resolution Imaging Spectroradiometer (MODIS) on NASA’s Terra satellite captured wider views of bloom events in the Sea of Marmara on on May 23 and May 25. NASA image by Josh Stevens (Earth Observatory) and Norman Kuring (NASA Ocean Color group) using Landsat data from the U.S. Geological Survey. Caption by Mike Carlowicz. Freshened surface water and abundant nutrients lead to an explosion of algae in the inland sea. Hurriyet Daily News (2013, April 26) Red tide poses risk for sea ecosystem. Accessed May 30, 2015. 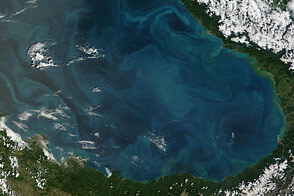 NASA Earth Observatory (2012, May 19) Bloomin’ Black Sea. NASA Goddard Earth Sciences Data and Information Services Center (2003) Sea of Marmara: Where Ancient Myth and Modern Science Mix. Accessed May 29, 2015. 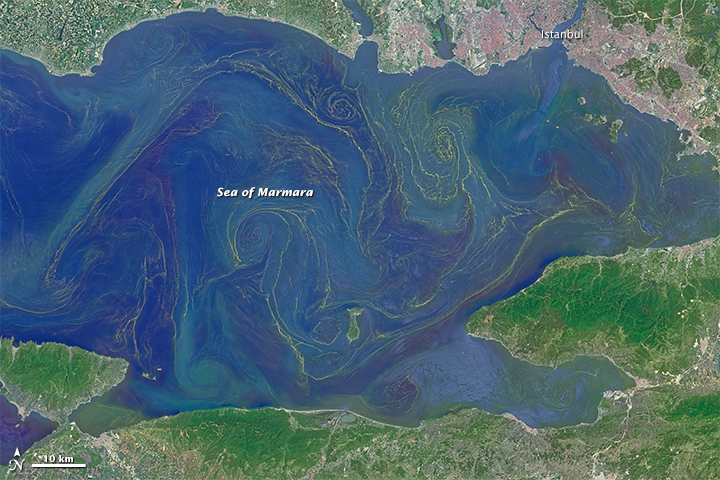 NASA Ocean Color (2013) Phytoplankton in the Sea of Marmara. Accessed May 30, 2015.